You know what they say: an ounce of prevention is worth a pound of cure. And when it comes to your family’s safety, you’ll pull out all the stops to make sure your home is secure and theft-free. Unfortunately, according to FBI data, about one in every 36 homes will experience a robbery this year, so your family may be more vulnerable than you realize. Beyond the safety risk and the psychological toll of break-ins, home burglaries result in about 4.7 million dollars of property loss annually. And according to security system review site Safewise, almost a third of those break-ins happen because a door or a window was left unlocked. Unless properly secured, your home’s windows put you at increased risk of a robbery. Windows offer a weak point in your home’s security, since many homeowners leave them unlocked or rely on flimsy latches that don’t do enough to stop burglars. And of course, if all else fails, a burglar can simply smash the glass and climb right in. That doesn’t mean you need to sit up every night watching your windows for a chance break-in. Window manufacturers and security companies now offer a plethora of options that can make your windows safer. And that should definitely help you sleep better at night! As mentioned before, a vast number of break-ins occur simply because a home’s windows are not properly locked. Always latch your windows before leaving your house. If you have trouble remembering, smart lock sensors—like the VeriLock system available from Andersen windows—can alert you if you happen to leave a window open or forget to latch the lock. However, even if you never leave a window open or unbolted, weak latches still offer a point of vulnerability. A keyed lock provides the highest degree of protection—it replaces the existing latch so the window can only be opened using the key. This also makes the window safer if you have young children around. However, it could pose a problem if you needed to get out quickly—for instance, in the event of a fire. Track Stop: Made up of a lever attached to a stopper, this lock works well for sliding windows. Key Track Stop: Instead of a simple latch, this stopper has a key that you turn to fix a double-hung or sliding window shut. You can affix the stopper to the track to position the window open, as well. Locking Pin: Like a door chain, this lock latch sits across the two window sashes in a double-hung window to keep a burglar from lifting the window open. 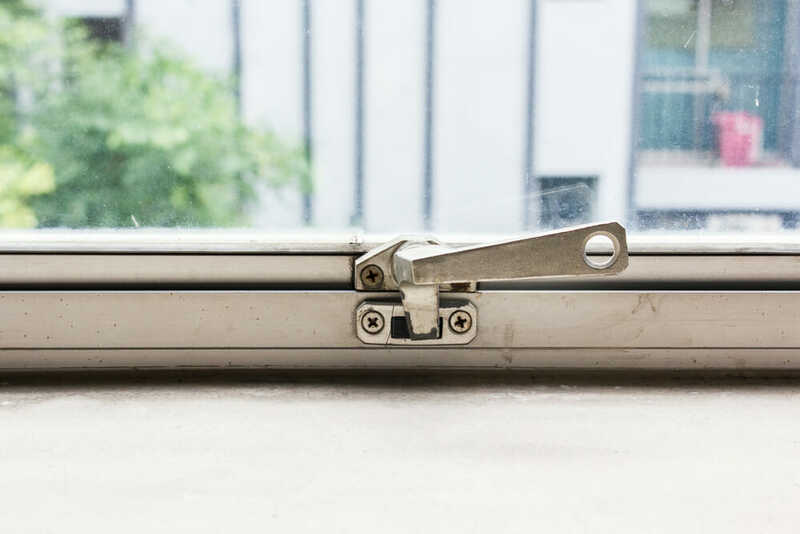 Ventilating Lock: In a double-hung window, this lock sits attached to two sashes. One side has a pin that fits into a hole below, securing the two pieces. Hinged Wedge Lock: Also appropriate for a double-hung window, this piece sits along the track of the window and wedges into the bottom sash when lifted. Of course, even the best lock won’t do you much good if a burglar decides to shatter the window. This is where protective window glazings and reinforced glass can be a real help. If you have been thinking about replacing your windows anyhow and find yourself concerned about the strength of the glass, you have several options at your disposal to help strengthen your windows. Tempered Glass: Up to ten times stronger than conventional glass, tempered glass differs from its counterparts in its composition. Heat-treated to improve its resistance to shattering, this glass breaks apart into fine granules, rather than shards. Typically, you can expect to spend more for tempered glazing. 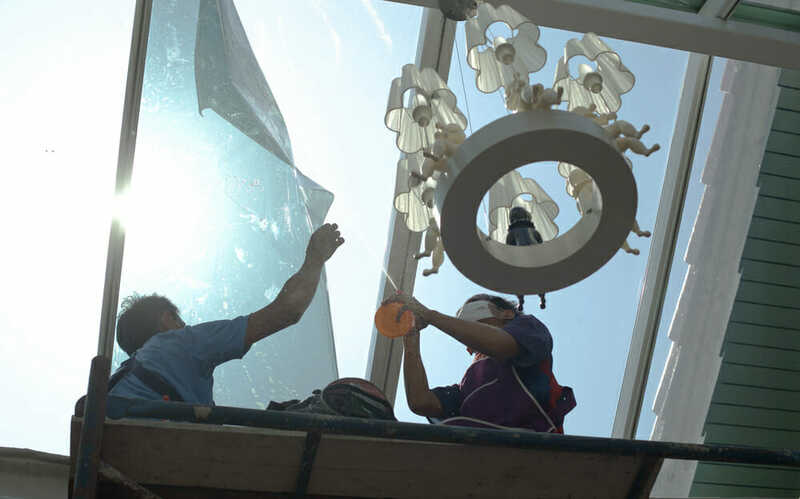 Laminated Glass: Somewhat less durable than tempered glass, laminated glazings—also referred to as safety glass—consist of two pieces of glass with a layer of vinyl sandwiched in between. Safety glass serves as a powerful theft deterrent. If a window replacement just isn’t in the cards for your home right now, a security film may make a great alternative. Window films like 3M’s Scotchshield series hold glass pieces together, making it more difficult to break and enter. They can also protect you from flying glass in the event of an accidental break. Window films also have energy efficiency benefits, too. The film typically works to block UV rays and solar radiation entering your home. So you could potentially reduce your electricity consumption when you install them. Energy efficiency and security? Where do I sign up?